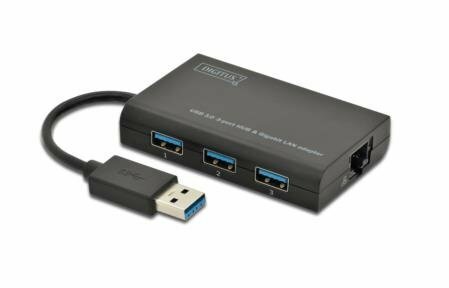 With the DIGITUS USB 3.0 Hub & gigabit LAN Adapter you can connect 3 additional USB 3.0 high speed devices to your Ultrabook, notebook, Macbook, Macbook Air etc. Printers, hard drives, flash memory, card reader, speakers and many more devices can be easily connected via the USB interface. In addition, the adapter extends your computer to an gigabit Ethernet port and makes it networkable (PC/Notebook), because nowadays the most mobile devices can only be integrated into the network via wireless LAN.